NEW - Member Rewards Now Live! 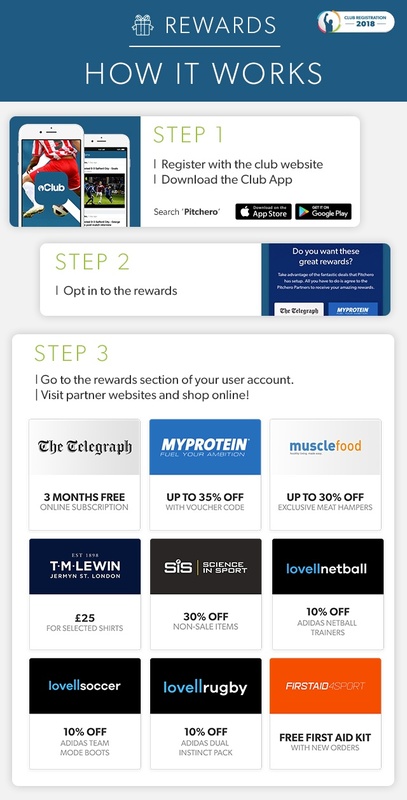 The club has teamed up with Pitchero to reward club members with exclusive offers from top brands including; My Protein, The Telegraph and TM Lewin. Club members who register with the club, will from today receive exclusive member rewards from leading online brands. All you have to do is register via the club website or Pitchero Club App and Opt in to member Rewards when prompted. - And many more great offers! Club Member Rewards is a new initiative designed to reward members for supporting the club online. By registering with the club website or downloading the Club App you will receive the latest club news first! Plus players and parents will have access to fixtures, availability, training times, team selection, videos and team chat! Get started today! Register now or search Pitchero in the App Store. Already registered? Download the Pitchero Club App and login to get your rewards.